Ordinary granola bars get a tropical twist with this healthy, no-bake recipe for Mango Coconut Granola Bars! Gluten-free, vegan-friendly and so easy to make! You are going to love this recipe for Mango Coconut Granola Bars, because they are bursting with tropical flavors and are made with just 6 ingredients. They are an ideal on-the-go snack, because they are easily portable, nutritious and will keep you feeling full for a long time. 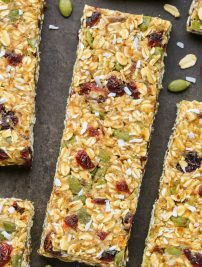 These homemade granola bars are made entirely with wholesome ingredients, like rolled oats, almonds, shredded coconut and dried mango. Pureed dates and honey act like a glue that binds everything together. 1. When adding the date-honey paste to the dry granola mixture, use your hands to mix all of the ingredients together! Using a spoon will not cut it, because the mixture will be super sticky. 2. Once everything is mixed together, be sure to very firmly press the granola mixture into the baking pan with your hands, the sides of a mug or a flat dish. 3. Allow the granola mixture to chill and harden completely before cutting into bars. Optional: To really bring out the flavor of the oats, you can gently toast them on a baking sheet at 350°F for 10 minutes, just until they become fragrant. No-bake Mango Coconut Granola Bars made with just 6 ingredients. Healthy, super tasty and so easy to make! In a large mixing bowl, combine the oats, dried mango, coconut and almonds. Add date mixture to oat mixture and mix, using your hands or a spoon, until well combined. Transfer mixture to the prepared pan and firmly press into an even layer. Mango and coconut together is my favorite flavor combination! And your granola bars look so yummy! Hi Tessa! Yes that is a wicked combo! Thanks so much! I love coconut bars! these are perfect for summer. and they look so so delicious!